James Pickering and Jonathan Smoots in the Milwaukee Rep’s “A Christmas Carol.” Photo by Michael Brosilow. Many ghosts of Christmas Past inhabit the Milwaukee Repertory Theater’s closet. 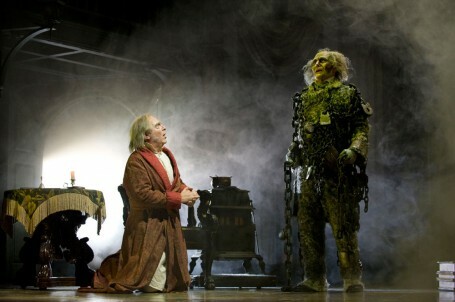 This year marks the company’s 36th annual seasonal production of A Christmas Carol, penned by Charles Dickens in 1843. Many of us know the story by heart, and the Rep’s adaptation, by director Joseph Hanreddy and Edward Morgan, is a faithful Victorian reproduction. A sizable cast of all ages populates the London streets on the Pabst Theatre’s stage and fills them with both holiday festivity and gravitas. The story revolves around Ebenezer Scrooge, that old skinflint who ultimately becomes a shining example of Christmas joy and goodwill. James Pickering plays Scrooge as a cool, calculating businessman, with eyes only for the bottom line. Pickering’s nuanced portrayal suggests that Scrooge’s tightfisted and even cruel nature results from injury rather than from a bona fide heart of stone. But Pickering’s Scrooge is funny, too. 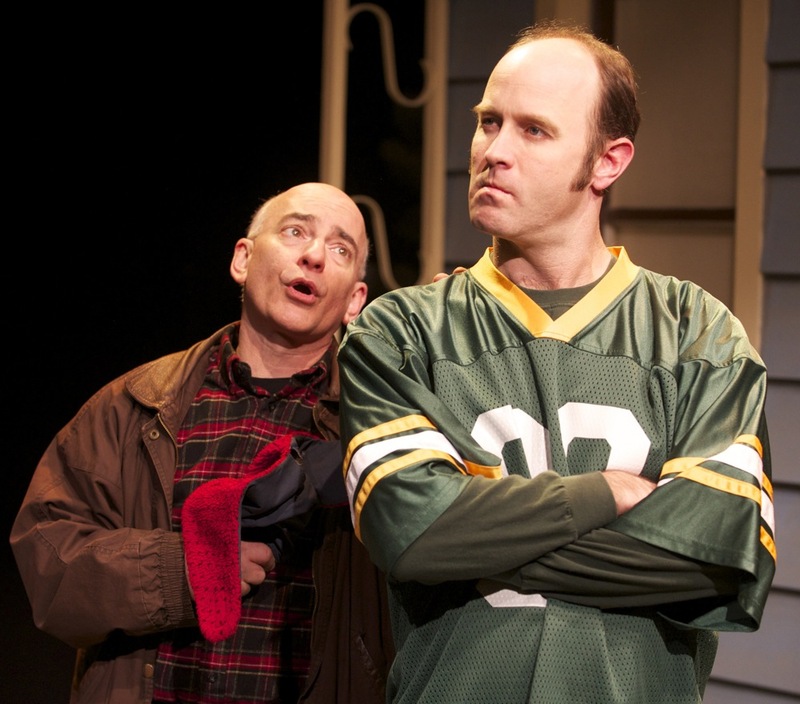 His dry wit elicits chuckles from the audience, particularly in an early scene with Fred, his exuberant nephew, played with great charisma by Steven Marzolf. A few interesting twists in this production do not detract from the traditional nature of the period costumes and sets. The ensemble cast gathers as a large chorus for transitional scenes, injecting musical interludes of candlelit Christmas carols. The Ghost of Christmas Past, played by Deborah Staples, appears as a Rococo delight, aglow in dazzling gown. Two children, allegories for Remembrance and Forgiveness accompany her and add an uncommon touch. They prefigure the wretched waifs called Ignorance and Want, the young companions of the Ghost of Christmas Present. Jonathan Smoots’ presents this ghost as burly and jovial, a spirit indeed of good cheer. Let us not forget that A Christmas Carol is a ghost story. The scarier ghosts — Jacob Marley and the Ghost of Christmas Future (Mark Corkins and F. Tyler Burnet, respectively) — are imposing and fearsome. As the story progresses, the darker aspects brought on by these specters are thrown more sharply into relief. Scrooge becomes aware of his own mortality as the final ghost bids him to watch undertakers hauling his coffin away; his mortal remains are a burden and mourned by no one. Scrooge’s endgame contrasts tellingly with the small coffin of Tiny Tim and the funerary entourage of tearful Cratchits and friends. One was a young boy so dearly loved for his kind and warm heart, the other an old man coldly rejected as he rejected the world. A Christmas Carol can be understood on many levels. It is pure holiday entertainment, classic characters come to life. It has some laughs and will undoubtedly tug at your heartstrings. More deeply, it is a morality play with relevance to our own time of growing disparity between haves and haves-not. The Milwaukee Repertory Theater does ample justice to the beauty, nuance, and heart of this classic tale. The Rep’s A Christmas Carol runs through Christmas Eve. Click here for a complete schedule and to order tickets or call the Rep’s box office, 414 224-9490.